1938; 222 pages. Genre : British comedy. Overall Rating : A.
O Happy day! My local library has a veritable trove of P.G. Wodehouse books! I can see me going on a "Jeeves" kick in 2009. 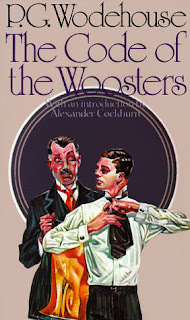 The Code Of The Woosters is a more typical Jeeves books than The Return Of Jeeves, reviewed earlier here. TCotW is told in the first-person, and by Jeeves' usual employer, Sir Bertie Wooster. Bertie and Jeeves are guests at a neighboring estate, and Bertie is being blackmailed by three different relatives, each of whom wants him to purloin a cow creamer from there for them. The task is complicated by the fact that the present owner and his goose-stepping bodyguard already suspect that Bertie is a thief. It gets worse when someone pinches the local constable's helmet. Suspicion immediately focuses on Bertie, and inexplicably, said helmet keeps showing up in his room. This is vintage Wodehouse. Besides the plethora of threads, there is a recurring theme of Bertie & Jeeves confidently "taking care of everything", only to find themselves in deeper doo-doo five minutes later when something inevitably goes awry. When they take care of that new challenge, another unforeseen twist immediately shows up, landing them in an even stickier wicket. The book is well-written, quite funny, and full of Britishisms. It also is notable that Wodehouse takes some political jabs at Fascism in the book, save that here the brown-shirts are replaced by black-shorts. This buffoonery was quite brave, given that Wodehouse wrote this in 1938, when Hitler and Mussolini were on the rise in Europe. In the end, all turns out well, and the Code of the Woosters remains intact. I highly recommended this book, especially since it's probably available at your nearby library. 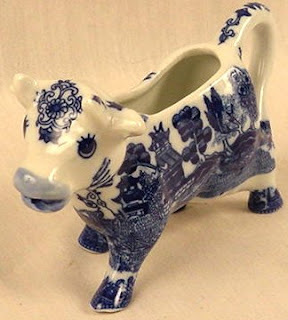 Maybe I've led a sheltered life, but I had never heard of such a thing as a cow-creamer. I could of course, deduce what it was. Still, it was nice to find that Google Images has dozens of pics of them, one of which is to the right. Amazingly, the source of all my knowledge, Wikipedia, does not yet have an entry about cow-creamers. They give one short sentence about them bring a favorite Wodehouse prop, and that's it. So if you're yearning for instant fame by writing an article for Wikipedia, here's your opportunity. I might just have to check one of these out. See? 5-Squared is changing my reading habits, too! I just love cow creamers. I do not actually have one of my own, but I have purchased a few for friends as gifts. I also love blue and white china and the cow creamer you show in your picture is really cool. Trixie - i think creamers are fading into history. my grandmother used to have a (regular) creamer, and that was the only way she'd allow milk-for-coffee on the dinner table. one of our holiday traditions at her house was to try and "sneak" the milk carton onto the table without her seeing it. we always failed of course, but it was fun trying. Amanda and Christina - i look forward to hearing what you think of Wodehouse. the emphasis of course is on humor, but i think i read somewhere that these Jeeves stories first appeared in Saturday Evening Post, so the writing is excellent. i think active participation in a book blog (even if it is just reading the reviews there) inevitably leads to the broadening of one's literary horizons. i know mine has. FWIW, Christina, i went looking for Fate Fantastic at the library. it wasn't there, but another Greenberg anthology was - "Fantasy Gone Wrong". so that's the latest way that 5-Squared has impacted my reading. I just got Fantasy Gone Wrong in the mail the other day. I glanced through it and some of the stories look good and (bonus!) I've seen several stories with unicorns (my favorite creature in the cosmos). I think it'll match my warped sense of humor. It'll be interesting to see how we both feel about the book. Fate Fantastic seems to be a hard-to-get book. I use a website to trade books and it took me sometime before I got that book. 5-Squared is definitely letting me know the feel of some of the books out there. It's good to see what people feel are the strong and weak points of a book. in addition to FGW, i have Spoon River Anthology on my TBR shelf due to a review by Julie; Hominids due to Byron; a second Camus book due to Amanda; and a second Toni Morrison book due to a suggestion left in a comment to The Bluest Eye. 5-Squared has a significant influence on what i will be reading in 2009.